They call Crested Butte "A Skier's Mountain; A Romantic's Town." When you pull in to the sleepy town of Crested Butte, you are instantly relaxed. Turn down Elk Avenue and step back in time. Crested Butte was originally settled in the 1880s as a mining supply hamlet. Colorful old Victorian storefronts line the main street today. The buildings are filled with restaurants, gift shops and t-shirt shops the usual ski town fare. 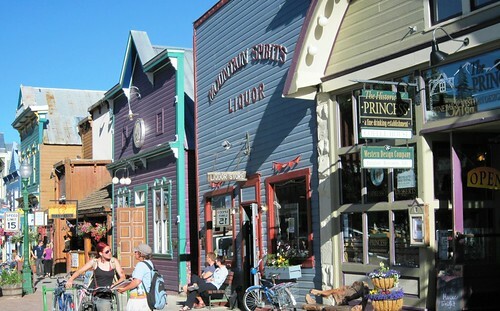 As one of Colorado's largest National Historic Districts, Crested Butte has preserved many of its original Victorian homes and buildings. Crested Butte plays host to the Crested Butte Music Festival, Crested Butte Wildflower Festival and Crested Butte Festival of the Arts. Head up the hill three miles and you've landed at Mt. Crested Butte, home to the slopes the locals love. The mountain has a little bit of everything, but it's best known for its extreme terrain and the steepest lift-accessed area in North America. In the summertime, the chairlift is open. You'll find plenty of hikers and bikers enjoying the beauty of the Elk Mountain Range of the Colorado Rockies. Elk Ave in Crested Butte. Photo courtesy Gunnison-Crested Butte Tourism Association. A great family meal can be found at the Slogar Restaurant, 517 2nd Street in Crested Butte. The building, dating back to 1882, is where gold miners used to stop in for a libation after work (one of nearly 20 taverns in the town). Now, The Slogar features family-style chicken or steak dinner that's to die for. The skillet-fried chicken is from a 1915 recipe. Heaps of mashed potatoes and hearty chicken gravy accompany it. You can hardly get enough of the whole kernel sweet corn in cream sauce. Of course, this is all served with an endless basket of mouth-watering powder biscuits, and topped off with homemade ice cream. You can hike all over the mountain up at the resort. Or take it easy by riding the chairlift up Mt. Crested Butte and walking back down the mountain. 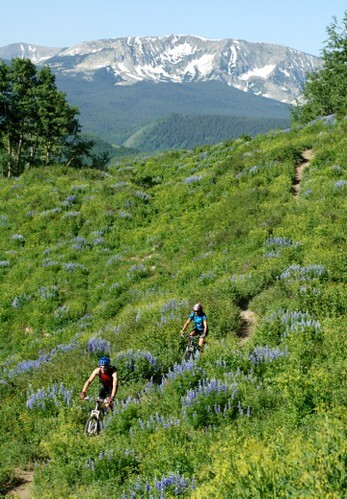 Crested Butte is a mountain biking paradise. Rental shops are all over Crested Butte and Gunnison. You can get bikes, helmets, water bottles and maps. The gearheads at the shops can set you up for short rides, or full- and half-day trips. Go off-road or ride through town. Child carriers are also usually available. Mountain Biking in Crested Butte. Photo courtesy Tom Stillo. The Crested Butte Center for the Arts coordinates all of the plays, art shows, concerts and cultural entertainment in Crested Butte. Crested Butte Center for the Arts, 606 6th Street, 970-349-7487. The Crested Butte Music Festival presents over 60 performances and workshops that span six weeks this summer in town and at the ski area at Mt. Crested Butte. The Festival seeks to present not only many kinds of music, but other arts as well, ranging from poetry reading to dance. June 30-August 12, 2012 Crested Butte Music Festival, 308 3rd Street, 970-349-0619. You can go fly-fishing on the East River, Taylor River and Gunnison River.In the Gunnison area, sail, windsurf or water-ski at Blue Mesa Reservoir. You'll find 20 miles of water and 96 miles of shoreline. Blue Mesa is Colorado's largest body of water and has been called "Mother Nature's Playground." Elk Creek and Lake Fork Marinas provide boat rental and fishing supplies. Pappy's Restaurant overlooks the Elk Creek Marina and serves family-style meals. The season runs from May 1 to October 1. Nearby is the Curecanti National Recreation Area which has three lakes. Follow Taylor River Canyon up to Taylor Reservoir for hiking, boating or fishing. Take a boat tour on Morrow Point Lake near the Black Canyon of the Gunnison National Park where you'll see spectacular rock spires including the Curecanti Needle. Crested Butte is a solid four-hour drive from Denver (230 miles). You go over several mountain passes, one of which is Monarch Pass. Coming over Kenosha Pass from Denver, the view of the South Park Valley is breathtaking. Small farms and homes are sprinkled throughout. It looks like how you'd imagine The West looked a hundred years ago. Or stop in Fairplay for hiking, horseback riding or a visit to the museum. There's also shopping in Gunnison (home of Western State College). Once you hit Gunnison, you're only 30 miles from Crested Butte.